Have you ever noticed a celebrity’s perfect smile and wondered how teeth can be so white and perfectly aligned? You may have been admiring the results offered by porcelain veneers. At Family Dentistry of Windsor, we recognize porcelain veneer procedures are for candidates from all walks of life. Led by Stephen D. Lipman, D.M.D., a cosmetic and general dentist with more than 25 years of experience, our office is committed to helping you create and maintain the smile of your dreams. A top Windsor cosmetic dentist, Dr. Lipman can consult you to help decide if porcelain veneers are a good fit for you. Strong teeth roots and teeth to which the porcelain shells can be affixed. A normal bite in which the upper and lower jaws come together easily without interference between upper and lower teeth. Mildly crooked teeth and are looking for an alternative to braces. Severely discolored or stained teeth that resist whitening even with professional treatment. Uneven or disproportionate gum lines (we also offer gum contouring, which is an excellent addition to a porcelain veneer procedure). Who Is Not a Candidate for Porcelain Veneers? Excessively crowded or crooked teeth that “buck” to one direction dramatically. These teeth would require too much removal of the natural tooth structure in order to accommodate the veneers and produce a good aesthetic. Extremely weak or broken teeth. Unsure feelings about having veneers. They are intended to be permanent and should not be removed. You are unable to keep a strict dental hygiene regimen and regular visits for teeth cleaning. Veneers can trap plaque and bacteria, leading to more serious issues if you do not keep them clean. Gingivitis or other gum or mouth disease. In an initial consultation with your Windsor cosmetic dentist, you will discuss the process and have moldings taken of your teeth to have your veneers custom-made. Your dentist will remove a small amount of your teeth’s enamel to both prepare a surface that the veneers will affix to, and make room for them. At your second visit, your veneers are delivered especially for you. 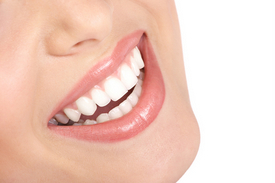 An adhesive is applied to your teeth, and your veneers will affix over each individual tooth. Your dentist will make sure your bite closes correctly and that you are able to floss and maintain regular dental hygiene. The quick-setting resin adhesive, when dry, will set your new veneers in place permanently. The results are instantaneous. For our patients in Windsor, porcelain veneers offer excellent results. We offer free consultations in which we can discuss your specific needs. Please contact us today for a confidential, informative discussion on porcelain veneers and all of the other services offered at Family Dentistry of Windsor.